When you are upgrading to version 1.0.0.328 (i.e. you downloaded & installed before, 09-Oct-2012, 1.0.0.328) you need to perform one additional step over the standard N52 BPA import solution. This is needed as many new features have been added & we wanted to provided an easy way to activate them for users on previous versions. Note that if you just install version 1.0.0.328 into a new MS CRM environment then there is no need to go through the upgrade steps. 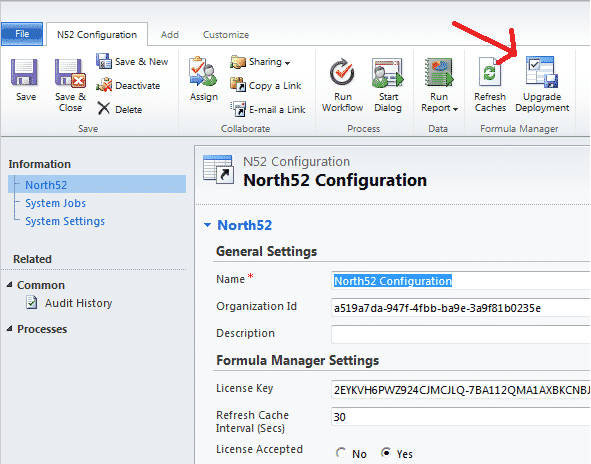 Navigate to the formula list within Dynamics CRM. Next click on the 'Open Configuration' button on the ribbon. Now the N52 Configuration entity will open & you next need to click the 'Upgrade Deployment' button. If it completes successfully you will see a message indicating this.